The Title "Amazin': The Miraculous History of New York's Most Beloved Baseball Team " is written by Peter Golenbock . This book was published in the year 2003. The ISBN number 0312309929|9780312309923 is assigned to the Paperback version of this title. The publisher of this title is MacMillan. We have about 97035 other great books from this publisher. 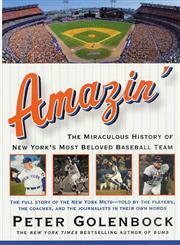 Amazin': The Miraculous History of New York's Most Beloved Baseball Team is currently Available with us.